From collectors' archives: Rare 1958 recordings of "The Hans Koller New Jazz Stars" at the peak of their art, restored from radio tapes and original EPs. Lost work by one of Europe's leading tenor saxophonists from the Golden Age of cool and modern jazz, featuring Albert Mangelsdorff (tb), Helmut Reinhardt (bars), Peter Trunk (b), Hans Hammerschmid (p), Rudi Sehring (dr) - with Zoot Sims (ts) guesting on two tunes ("Zoot Meets Hans") plus Hans Koller playing in the Orchestra of Eddie Sauter. 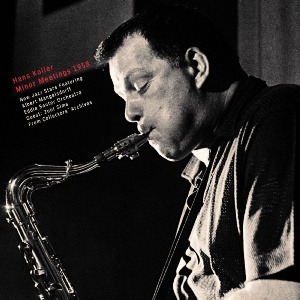 From collectors' archives: Rare 1958 recordings of "The Hans Koller New Jazz Stars" at the peak of their art, restored from radio tapes and original EPs. Lost work by one of Europe's leading tenor saxophonists from the Golden Age of cool and modern jazz, featuring Albert Mangelsdorff (tb), Helmut Reinhardt (bars), Peter Trunk (b), Hans Hammerschmid (p), Rudi Sehring (dr) - with Zoot Sims (ts) guesting on two tunes ("Zoot Meets Hans") plus Hans Koller playing in the Orchestra of Eddie Sauter. Half of the tracks previously unreleased, recorded at the German Jazz Festival (Althoff-Bau, Frankfurt Zoo), CD version/ digital album comes with two unheard bonus tracks. Carefully restored and mastered for 6-Page-Digipack-CD and limited Vinyl LP, including new sleeve notes and artist photos by Josef Werkmeister. "Minor Meetings 1958" brings lost or completely unknown recordings by Hans Koller (1921-2003) from the year 1958 back to life. Hans Koller is one of Europe's leading saxophonists of the last century. If one is talking in USA about German jazz musicians, the name of the native Austrian is always present. Already in 1953, the musician and painter from Vienna causes an international sensation, in his quartet or quintet and with an early formation of the "Hans Koller New Jazz Stars". Legendary musicians like pianist Jutta Hipp or trombonist Albert Mangelsdorff belong to the group. They play a European form of Cool and Modern Jazz and the audience is impressed by their high level of playing. For the fans the "New Jazz Stars" become stars in German jazz heaven. In the same year recordings are made for the American Discovery label and the band goes on tour in Germany with the group of Dizzy Gillespie. In 1954/55 Hans Koller can be heard with Stan Kenton, Lee Konitz and Lars Gullin. Jutta Hipp is leaving the band to form her own group and to record in USA. At least with her recordings for the Blue Note label, for which she produces three albums in 1956, Jutta Hipp is earning the reputation of being "Europe's First Lady in Jazz".